ASUS launched the Xonar Essence One Hi-Fi USB Digital to Analog Converter and Headphone Amplifier, the first DAC with 8x symmetrical upsampling technology. With most modern audio signals stored in digital format, the ASUS Xonar team has catered to audiophiles’ needs and launched its first hi-fi USB digital-to-analog converter (DAC), the Xonar Essence One. It is an industry-leading high-end USB DAC with the world’s first 8x symmetrical upsampling technology, while also featuring a 120dB signal-to-noise ratio (SNR), audiophile-class headphone AMP and eleven operational amplifier (op-amp) design for distinct tonal customization. While common upsampling USB DACs indistinguishably transfer various audio sources to 192kHz, the Xonar Essence One upsamples 44.1/88.2/176.4kHz input to 352.8kHz and 48/96/192kHz input to 384kHz symmetrically (Note: 44.1*8=352.8kHz; 48*8=384kHz). As a result, data volume is also increased by upsampling the bit-rate to 32bit, corresponding to the original content and faithfully preserving the details of the user’s music collection. The average SNR, of other USB DACs is about 110dB, but with an extremely high 120dB SNR, the Xonar Essence One provides audiophiles with clearer sounds, enabling minute sound details to be heard while significantly reducing noise levels. A dedicated power supply ensures that clean power is delivered so the sharpest sound is heard, with excellent immunity to noise from the AC line. The Xonar Essence One features a fully swappable op-amp design, unprecedented for a high-end USB DAC. An op-amp is the key part in a DAC that amplifies the analog signal and affects tonal characteristics, such as darkness or brightness of sound or the overall sound image. The Xonar Essence One allows the user to swap every op-amp that is on board, for a truly customizable sound. It upgrades digital music stored on your computer into clear and detailed, life-like sounds. It also features XLR and RCA connections for plugging end audio devices. 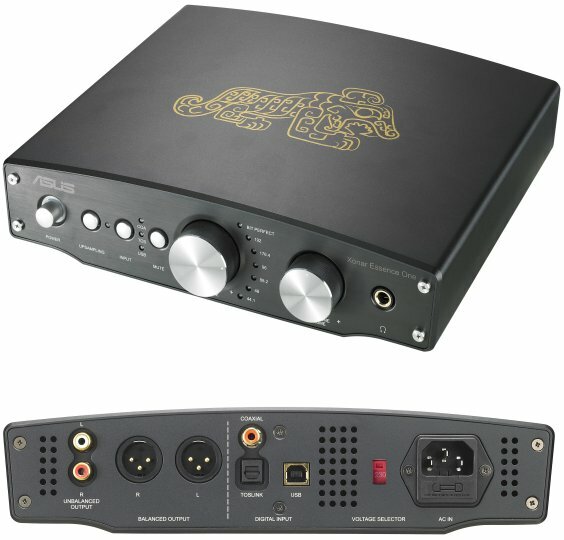 With an S/PDIF input and input selection, the Xonar Essence One also serves as an independent DAC which can connect to standard CD/DVD players and provide high quality music without the need for a computer. The Xonar Essence One integrates an audiophile-class headphone AMP circuit which powers up all Hi-Fi headphones, enabling 100% performance even with impedance of sets up to 600ohms. It offers extra dynamics, sound details and low distortion for the absolute best sound quality possible.